To listen to the White House and its supporters in and out of the media, you would think that opposition to "ObamaCare" is the hobgoblin of a few small minds on the right. Racists, fascists, Neanderthals, the whole "Star Wars" cantina of boogeymen and cranks stand opposed to much-needed reform. Left out of this fairly naked effort to demonize many with the actions of a few is the simple fact that ObamaCare -- however defined -- has been tanking in the polls for weeks. President Obama's handling of health care is unpopular with a majority of Americans and a majority of self-proclaimed independents. Focusing on the town halls has its merits, but if you actually wanted ObamaCare to pass, casting a majority of Americans as the stooges of racist goons may not be the best way to go. Imagine if George W. Bush, in his effort to partially privatize Social Security, had insisted that the "time for talking is over." Picture, if you will, the Bush White House asking Americans to turn in their e-mails in the pursuit of "fishy" dissent. Conjure a scenario under which then-Senate Majority Leader Trent Lott derided critics as "evil-mongers" the way Harry Reid recently described town hall protesters. Or if then-House Speaker Dennis Hastert and then-Majority Whip Tom DeLay had called critics "un-American" the way Nancy Pelosi and Steny Hoyer did last week, or if White House strategist Karl Rove had been Sir Spam-a-lot instead of David Axelrod. Now, I'm not asking you, dear reader, to do this so that you might be able to see through the glare of Obama's halo or the outlines of the media's staggering double standard when it comes to covering this White House. Rather, it is to grasp that the Obama administration has been astoundingly incompetent. The left, broadly speaking, has been attacking conservative talk radio and all it allegedly represents for the better part of 20 years now. When Bill Clinton needed a convenient villain, he attacked Rush Limbaugh. When Bush emerged victorious from the Florida recount, liberals concluded that what they really needed was their own version of Limbaugh. In March, at the first sign of resistance from congressional Republicans, Obama complained that the GOP was Limbaugh's lap dog, and both the White House and much of the press corps went into anti-Limbaugh campaign mode. One of the reasons the term "ObamaCare" has become a journalistic convention is that there is no bill. You can't talk about Obama's actual health care plan because there isn't one. There are a bunch of competing bills, proposals, ideas swirling around the halls of Congress like flotsam in a sewer. As even Robert Reich, Clinton's Labor secretary, recently conceded, the failure to put forward a concrete proposal allows opponents to pick from a menu of scary ideas and possibilities, all of which can be labeled ObamaCare. Suspicion of bad motives is only reinforced by Obama's determination to steamroll to victory. Indeed, Democratic dudgeon that the town hall protesters don't want civil debate is hysterical, given that Obama wanted this over before the August recess. No wonder the president who thought the time for talk was over long ago now doesn't like the talk he's getting. Some might say the real story is to be found in the eroding support from independent voters and Blue Dog Democratic congressmen. 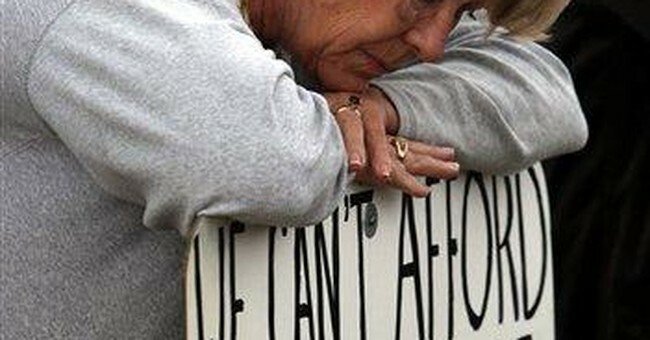 Or in the panic among seniors that Obama will raid Medicare. Or in his inability to get progressive Democrats to agree to a bipartisan approach. Or maybe the real story is Obama's manifest inability to sell a program he's invested his presidency in. But no. Obama wants the debate to be about angry white men. And, as lame as that is, that's what's happening. It won't make ObamaCare a reality, but it will shift the blame from where it rightly belongs.